Tender mixed greens are topped with green onions and cooked beets for a colourful and fresh green salad. Feel free to dress up this beet salad with some crumbled feta or toasted nuts. Mix sugar substitute and corn starch in medium saucepan. Add 2 Tbsp. dressing and vinegar; cook and stir 2 min. or until clear and thickened. Remove from heat. Add beets; stir to evenly coat. Cool. 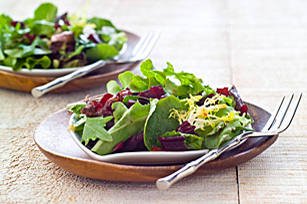 Toss salad greens with onions and remaining dressing in large bowl; top with beet mixture. For extra flavour, top salad with 3 Tbsp. Kraft Feta with Oregano, Sun Dried Tomatoes & Cracked Peppercorns Cheese. Help your friends and family eat right with this delicious salad that's prepared with better-for-you products. And as a bonus, the salad greens provide an excellent source of vitamin A.